A look in to the design mechanics of City of Steam. Developer Journal by ‘City of Steam’ Team. When amazing people who want to play the game give us their hard-earned money, we like to reward them. When our early supporters gave us enough for the Paragon tier, we wanted to show our appreciation by inviting them to join in on the creative process. Going from an idea or sketch to an actual in-game item with animations and everything is actually a pretty long and involved process, so we had to phase it out as we move forward into further Beta stages in order to focus on our own content. Still, many great ideas and additions came from it, and we’re proud to share it. And now, on with the designs! 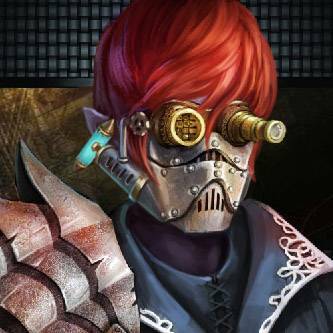 This time we’ve got four of them for you, from a 2-handed engine sword to a Steampunk ‘Vader’ mask, we’ve got it all. Let’s go through the four latest designs and show you some of the back and forth between our wonderful Paragons and ourselves. Uvhash wanted a rather imposing mask, after taking in his designer notes and the pictures he sent in we were sure we could make something fantastic. Fusing the goggles and facemask together with vials of liquid on the side, it makes for a pretty intimidating sight. You can see how the concept turned out, which he asked us to include on his customized Avatar(it was a 2-in-1 concept drawing job!). So what was Ryuusei’s response? While Ryuusei designed a very multifunctional weapon, Vinal had a very specific weapon in mind, from his drawings and the correspondence we had with him we could clearly see what he was going for. With this very clear outline of what he wanted, we went to work; this was the result after our masterful concept artist was done! A few things about this 2-handed behemoth we’re going to let you find out yourself once it’s in the game, but here’s the description for the weapon. 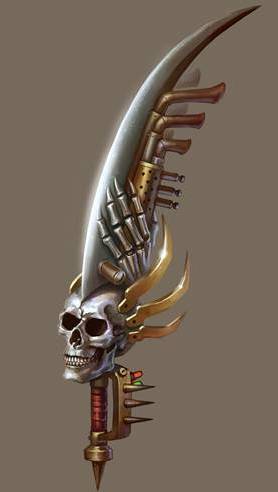 Basically, when wielding this sword you’re wielding a small engine, for that bit of extra POWERRR on your hacks ‘n slashes of course. Now you can really hit like a truck! 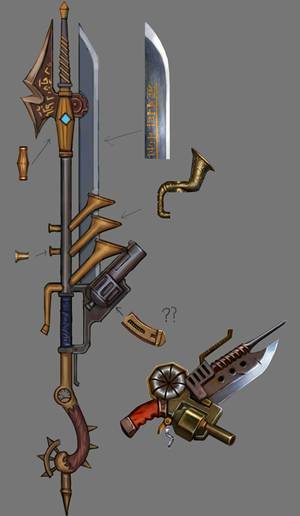 Winterschill didn’t waste any time in sending us his ideas, and soon we agreed on these two sketches of a rifle, one for the weapon itself, and one for the color placement. He also gave us a very specific description and provided just about every detail on it. So we went to work to make a rifle and a companion sidearm for short range. And this is how the Rin Insomnia Rifle, a high powered, long range weapon of pinpoint destruction, and the Rin MarkVIII Sidearm, a more compact version for close quarters combat, were born. Sleek, semi-automatic killing machines. We’ve received a lot of positive feedback on these weapon designs, a real shame we have to phase out getting this extra from our top supporter packs… Not a decision we made lightly, but it was necessary to focus on our way ahead. We’ve learned a lot from our Closed Beta process; not just from talking to our player community about their game experience and expectations, fixing bugs or rebalancing gameplay, but from things like the custom item design, we’ve found that to really make this game into what we envision, sometimes we sometimes have to stop taking on so much and concentrate on the bigger picture. The same goes for our own team; we’ve had to re-think our approach to making City of Steam so that we wouldn’t be in a constant, unending rush to finish everything. Now, we’re looking to have a better balance of delivering a good game without killing ourselves for it (we want to keep making other games, after all!). A chance to step back, breathe, and reflect has given us new perspective and renewed enthusiasm to get City of Steam out there for players to do what they do best: enjoy a good game.